SAVE MONEY! 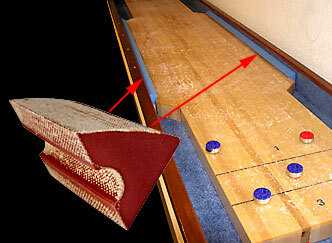 - Build Your Own Bumper Shuffleboard Table! 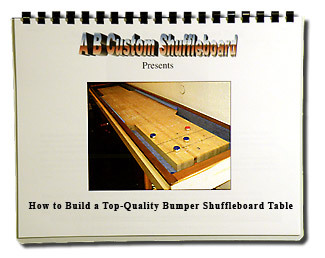 These step-by-step plans are easy to follow and include many pictures and illustrations to help you build a 12' bumper shuffleboard table. 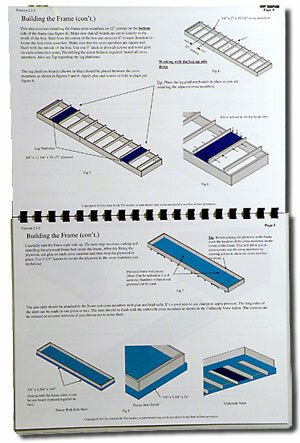 The plans contain 24 pages of information, illustrations and photographs that take you from start to finish in building your own 12' bumper shuffleboard table. (You can make the table longer if you wish by expanding the plan dimensions.) Printed in color on 8 1/2“ x 11“ premium paper, the plans are bound in a durable spiral binder that you can use as a handy reference in your workshop. The plans also include a complete materials list with dimensions for each part. Use your own creativity to give your tables an individual, custom look! Some of the necessary shuffleboard components such as an abacus, climatic adjusters and leg levelers can be purchased in our store. You will also need billiard felt, which can be purchased online or at a billiard store, depending on the color of your table, and bumper cushion material. 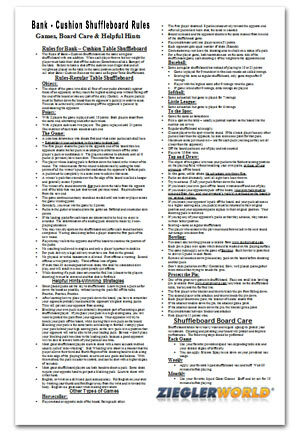 And don't forget our beautifully laminated Bank Cushion Shuffleboard Rules Poster! 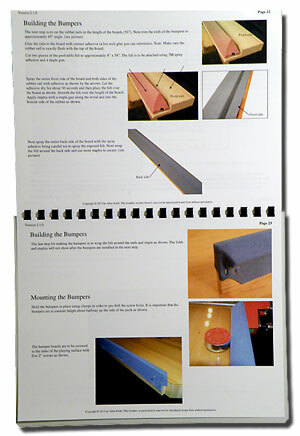 SAMPLE PAGES FROM OUR BUMPER SHUFFLEBOARD PLANS BOOK! Another item you will need to complete your table is bumper cushion material. Our material is 118 inches long and can be cut and used to make bumpers for one bumper table. Website Price $39.99 with FREE Shipping! Table saw, Miter saw, Random orbital sander, Surface Planer, Drill/Driver and bits, Router, Biscuit jointer, Various size clamps, Saw horses, Jig saw (band saw is also helpful), Tape measure, carpenters square, long straight edge, brad nailer, etc. A radial arm saw (or miter saw) are helpful for crosscuts. A. The plans are primarily geared toward making a 12' table. However, you can make the table longer if you wish to expand the dimensions listed in the plans. 11 inch x 17 inch poster is perfect for your Game Room or Bar! Laminated for easy cleaning. Hang on your wall with thumb tacks - or frame it if you desire! Our Poster Features Rules for: 1) Standard Play, 2) Horsecollar, 3) Baseball, 4) Softball, 5) Little League, 6) Table Shuffleboard Bowling, 7) Protect the Pin, 8) Tap & Draw, 9) to the Spot. Also features Helpful Hints and Board Care Tips! Website price $18.99 with FREE Shipping!